On 20 Sept, 2018, Michelle Lazo, ACAD student designer, and Michelle Reid, City of Calgary Cultural Landscape Lead, met with Water for Riley in Riley Park. The mission: finalize where each bloom would be planted, and in what configuration. Michelle and Michelle visualize what the petals will look like once the drinking fountain is installed where they stand. The fabricators and engineers are aware the foundation pad design must accommodate all types and heights of wheels so that the drinking fountains are fully accessible. Together, we staked the spots where the five stems on their concrete pads would support the blooms. Michelle L explained her vision for an organic rooting of the blooms in the soil. It’s so exciting to have progressed to these decision points. Meanwhile, Trail looks like he just wants the decisions made already so he can get a drink in Riley Park. Come to think of it, after the years of effort, W4R agrees and looks forward to that time too. NWHP REIT, Government of Alberta, The Calgary Foundation, and The Parks Foundation Calgary, who support the project and make the work of bringing water to Riley fun. All the donors, sponsors and local supporters, to whom W4R is so very grateful. for Riley Park, for you, and for the future. Donate to make this vision become reality. At the instructions to seller page, specify that your support is for The Water for Riley Project. The Parks Foundation issues tax receipts for donations greater than $10.00. We invite everyone to participate as a volunteer, fundraiser, donor, sponsor, or any other role. Call 403 862 1923 and leave your contact information. How W4R works partly explains our successes so far. A few members of the organizing committee have been involved from the start. Other people have contributed skill and time as tasks required. W4R has been blessed with the right people offering the right skills at the right time. On 27 April 2017, Jen Dobbin of The Dobbin Group met with Michelle Vincent and Natalie Back, stalwart W4R volunteers. who else should we talk to? what contacts do you have that might introduce us? when can we meet with those others? where should we go for those connections? We have a core committee that holds the vision and provides continuity. Fresh ideas and energy come from a cast of changing volunteers who share the vision and offer their time as they have some available. Michelle and Annie MacInnis, Executive Director of Kensington Business Revitalization Zone (BRZ), met to discuss mutual interests on 10 May, 2017. We’re very grateful for these cross-fertilizing, idea-sharing meetings. It’s like shortcuts on a long journey; we learn from their wisdom and experience so we don’t have to build a road they’ve already walked. Phase 1, over the past year, garnered 21 drinking fountain designs. In phase 2, the jury shortlisted three designs that went for technical review. The jury met and decided unanimously on one design. Phase 2 concludes in mid-January, 2017, when the jury’s selection of the final design is announced. W4R thanks the anonymous five jurors for diligent volunteer service, and their superb Chair, Sally Truss. 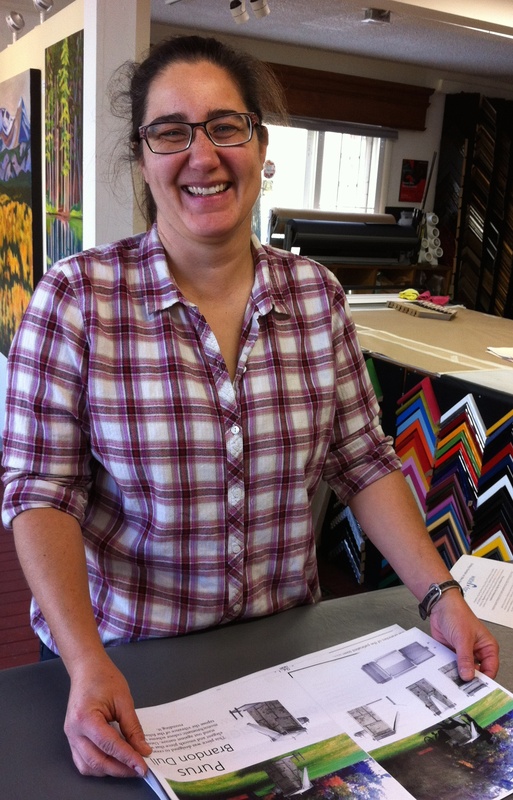 W4R is so grateful to receive a Stepping Stone grant for the celebration at which the winning design will be announced. A volunteer planning committee is organizing a gathering soon to be held on ACAD’s campus. Everyone will be invited, so stay tuned for the details of this public event. Thank you to The Calgary Foundation, wonderful volunteers and ACAD, among others. Place2Give has been a creative, wise partner from the beginning of the project. As fiscal agent, Place2Give CEO, Gena Rotstein, gave W4R excellent advice. Place2Give’s advisory relationship with W4R will continue. Thank you to the Parks Foundation, which is now accepting donations on W4R’s behalf. 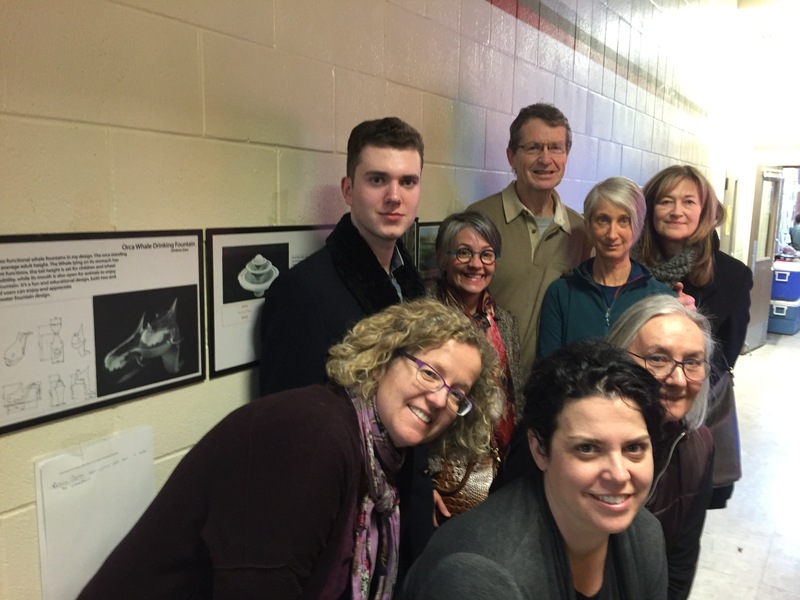 The Parks Foundation joins W4R’s other generous collaborating partners. Phase 3 is to build this winning design. Phase 4 will be the installation and grand unveiling celebration of this beautiful, functional, artistic drinking fountain. Phase 3 depends on successful fundraising to pay for the construction. If you are able to volunteer to help with one of the upcoming fundraising events, please call 403 862 1923. Let’s discuss which of these volunteer committees’ activities is right for you. To donate, click in the button to go to the Parks Foundation site. Once at that site, please indicate your donation is for Water for Riley Park. Special Events Coordinator: short term organizing a function at ACAD, long term organizing celebrations leading to conclusion of project, coordinating with Fundraising Committee. Donors: W4R is a citizen driven sub-committee of the Hillhurst Sunnyside Community Association. All donations of $10.00 and greater get tax receipts from the Parks Foundation. Click here to donate through the Parks Foundation and specify that your support is for the Water for Riley project. You can be involved with the drinking fountain for Riley Park. Call 403 862 1923 to volunteer, with questions or for more information. The City Parks Department was first among Water for Riley’s valued partners, helping every way it can. Parks officials acknowledge that Riley Park needs drinking water. The City of Calgary calls this an unfunded priority, meaning a drinking fountain’s need is recognized as a priority and there are no funds for it. The red oval in the photo shows where a nozzle and bowl should protrude from the wall during the few months the wading pool is open. It’s accessible only from the wading pool area. No dogs are allowed near it, it isn’t close to the children’s playground, and its location isn’t easily reached for the disabled. As the pool season started this year even this drinking bowl wasn’t available. According to officials in the City Parks Department, many years ago there was a concrete block drinking fountain southeast of the playground, like the one pictured below. The City removed that old fountain and, according to best memory, permanently sealed the water line to it. The future of drinking water in beautiful Riley Park is up to you. Help get one of these artistic drinking fountains installed in beautiful Riley Park. All donations greater than $10.00 get a tax receipt from the Parks Foundation. Please donate and specify your support is for the Water for Riley project. Call 403 862 1923 or email for more information or to volunteer. 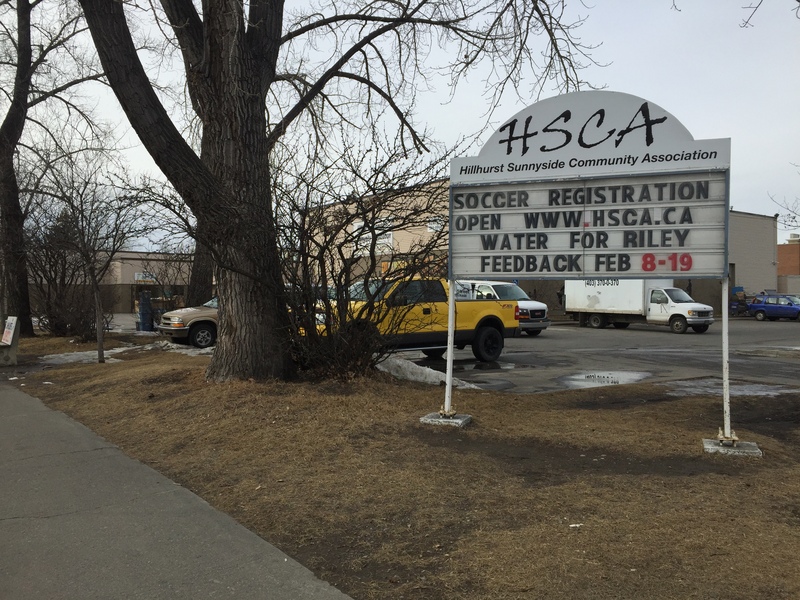 Water for Riley thanks the City of Calgary for all its help with this project and for the site where the drinking fountain will be installed – once the funds are raised. And thanks to all donors on behalf of all Calgary, past, present and future. On July 10, standing in line to pay for Sunnyside Natural Market groceries was also a time to look over the three shortlisted drinking fountain designs. The information display at Sunnyside Natural Market told the story of how Water for Riley came to be, what its aims are, and the principles that inspire us. Here is that explanation: You can be involved in the dream to plant a beautiful, functional, artistic drinking fountain in Riley Park. Call 403 862 1923 or email to volunteer, or with questions and comments. button to donate through the Parks Foundation, and specify you support the Water for Riley project. Thanks ACAD, and 3D Object Design course instructor, Kerry Harmer, and students; we have your 19 amazing designs. 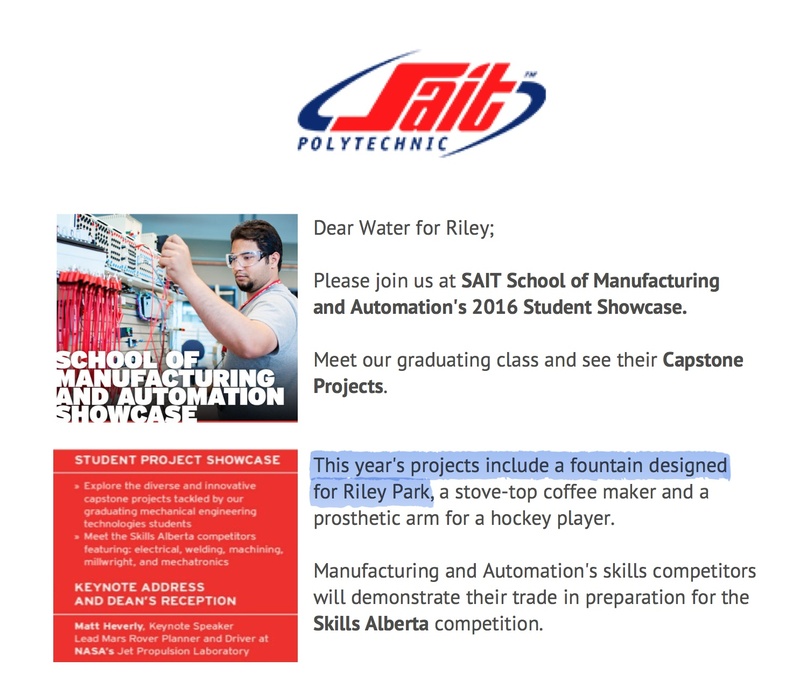 Now, we await the designs of the two SAIT teams who were assigned designing a drinking fountain for Riley Park as their Capstone Project. We expect those two designs on March 25th. Read the announcement of the first time all 21 designs are exhibited. Email to volunteer with Water for Riley, or call 403 862 1923. Help build whichever outstanding student design the jury selects. Riley Park is our community park, and good design improves quality of life, creates community, and boosts the economy. The submitted drinking fountain designs continue to send shivers over people viewing them. No one who sees the array of wonderful designs is left unmoved at the creativity and imagination of the student designers. The display of 18 ACAD student designs spent two weeks each at Hillhurst School and the Hillhurst Sunnyside Community Association (HSCA). In both venues the feedback is incredible. It became even more fun as the Farmers’ Market wound down. After 5:00 PM our special guests arrived. Viewing the exhibit together were: Ward 7 City Councillor, Druh Farrell with her key staff, Carol and Frank. Mountain View Constituency MLA, Dr. David Swann, The Calgary Foundation‘s Citizen Engagement Associate, Julie Black, This is My City Art Society Executive Director, Sally Truss, and Place2Give Foundation CEO, Gena Rotstein. Everyone had a great discussion of preferred designs, the cumulative impacts of the project, how fundraising efforts were going, how thrilled the ACAD students were to present their designs to the Water for Riley committee and supporters, and how the school used the display for multiple learning modules. So many small milestones on the path to a public drinking fountain. None of the concrete steps that get us closer to the fountain are as important to us as the relationships we build on the journey we walk together. As Councillor Druh Farrell noted, the story of how everyone became involved gives us goosebumps. 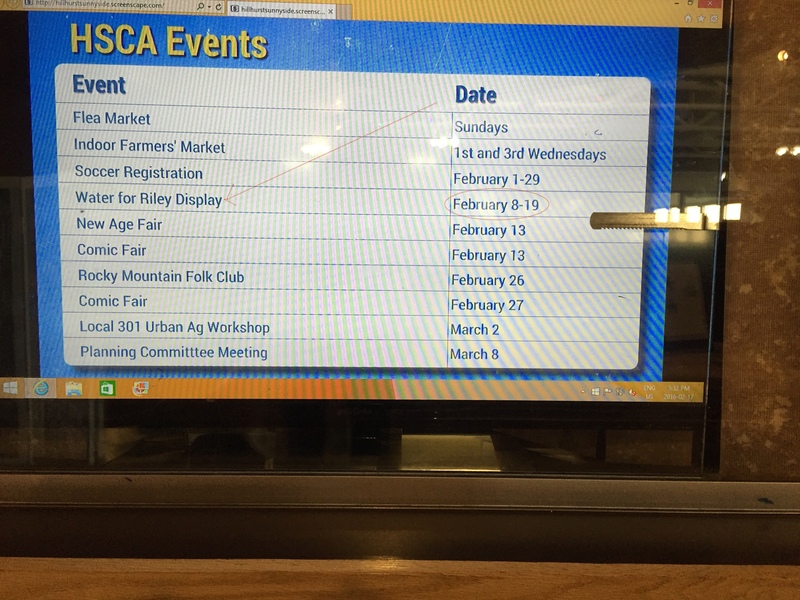 There are lots of people to thank, and special thanks to the wonderful HSCA staff that helped tremendously with display space, time for hanging the display, occasionally monitoring the exhibit , and providing a table at the Feb 17 indoor Farmers’ Market. Grateful. So grateful to all. Next post, the students of Hillhurst Elementary will get their due for their amazing feedback on the exhibit. The exhibit is located at the HSCA building until Feb 19. Click the button to donate to Water for Riley through the Parks Foundation, and be part of the community. Specify you are supporting the Water for Riley project. To participate or get more information, call 403 862 1923 or email Water for Riley. Exciting news to start the New Year. 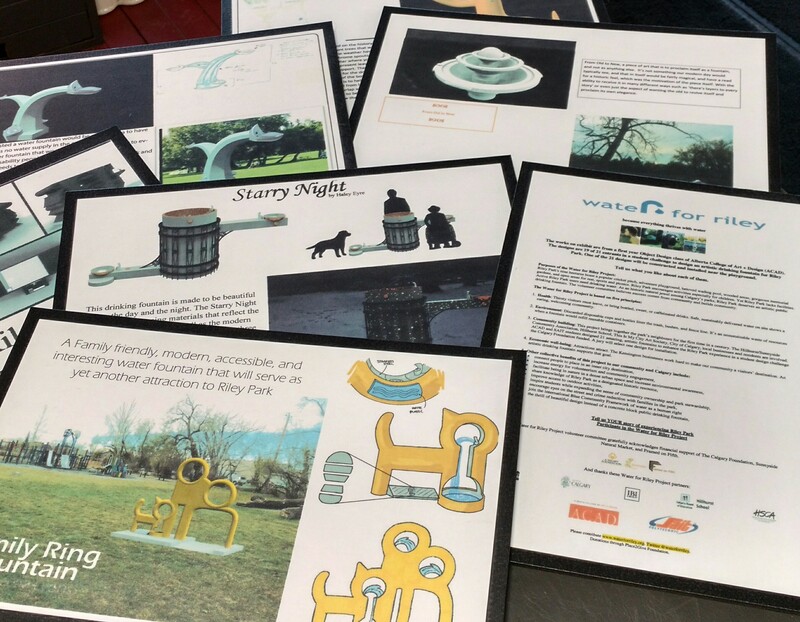 Alberta College of Art + Design students in the Object Design course rose to the challenge and submitted fabulous drinking fountain designs. We expect two further designs from Southern Alberta Institute of Technology‘s Capstone Project course. Between February 8th and 19th, the 19 designs we’ve received so far will be publicly exhibited ahead of the jury’s review. You can see those designs at the Hillhurst Sunnyside Community Association building; 1320 5 Ave. N.W. Drop in to view the submitted designs. Maybe even meet a student designer at the exhibit. Once we have all 21 designs, the five-member jury will create a short list of designs for our experts at IBI Group to inspect. From the short list, the jury will select one design as Riley Park’s drinking fountain. Framed on Fifth is to thank for a significant boost in fundraising. Hannah White and Patricia Gustafson, the wonderful owners of Framed on Fifth, are the latest generous sponsors of Water for Riley. Framed on Fifth donated the materials and labour to beautifully frame the student designs for the exhibit. Whether original art or a sentimental card, Hannah and Patricia make beautiful anything that can be placed in a picture frame. They also curate a unique, intimate gallery that features emerging artists in a friendly venue in the historic building (1911) across from the Hillhurst/Sunnyside Community Centre. Please join Hannah and Patricia at their incredible shows. Let them know how much we appreciate their generous support of Water for Riley. Please drop in to the HSCA building starting Feb 8 to view the exhibit, leave comments, visit the website, and make a donation. Fundraising will bring the drinking fountain to life. We’ve gotten this far on no budget and self-support for a few small expenses. However, to build the selected drinking fountain design will take money. Be part of it. Click on the button to donate through the Parks Foundation to make a wonderful, artistic drinking fountain become reality. Specify your donation is in support of Water for Riley. Tax receipts will be issued from The Parks Foundation Calgary. We invite everyone to participate as a volunteer organizer, fundraiser, donor, sponsor, or any other role. Call 403 862 1923 or email Water for Riley with your contact information. gallery/frame shop is open from 10:00 am to 6:00 pm Tuesday to Friday, 10:00 am to 5:00 pm Saturday. Phone – (403) 244-3688; e-mail info@framedonfifth.com; website – www.framedonfifth.com. Please drop by to check out monthly exhibits or to enjoy a great cup of coffee – sometimes (weather permitting) in the delightful little back garden.